Now there’s two of us. Once in a while I’ve wondered what David Frye was up to. 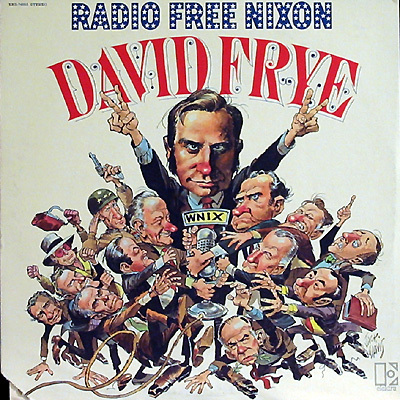 Frye was the master impressionist in the days of Presidents Johnson and Nixon, Watergate and the Vietnam War. His Richard Nixon was a more truthful version of the resident in the White House, because it admitted what the real Nixon never would. Although he was a brilliantly talented mimic, after Nixon’s resignation Frye faded from view. That was from David Frye’s obituary in today’s Washington Post, in which I learned what became of the political satirist as well as where he came from (born David Shapiro) before the comedy albums and TV appearances. I’m tempted to say that Frye’s heyday was also the heyday of impressions, and that impersonations of the famous in hindsight was a fad. Saturday Night Live, of course, has a long history of presidential impersonations stemming from those times. But this had to have been a golden age, with so many talented mimics in one place — Frye, Rich Little, Frank Gorshin, Sammy Davis Jr., Will Jordan, John Byner, George Kirby, Marilyn Michaels and Charlie Callas, who died Jan. 27. Mimicry has not disappeared. Perhaps the tendency is innate, an inborn urge to try to sound like someone else. Imitating is humanity’s way of learning survival skills, and we begin our studies soon after birth. In school, during that golden age of impersonation, I began to hone my own impressions of TV and film stars and politicians, soaking up lessons from Frye & Co. — John Wayne, Henry Fonda, LBJ. George McGovern, I learned, sounded like Liberace, so I was able to master two impressions at once. In school I also imitated my teachers. At this I did pretty well, and learned that mimicry can also be a maladaptive trait when practiced on the powerful. But that may be the initial attraction. A good mimic can show himself the equal of the imitated, whether child to adult or citizen to president. Imitation is at once a demonstration of flattery and a threat. A good mimic can run away with the image of the imitated. A brilliant mimic can also steal his soul. Kevin Spacey seems like a wonderful throwback to that golden age. How I became a Luddenite. When I was a kid, I had a friend who lived in the Old House. Inside it were old phones, old radios, old clocks. If my friend’s family had it, it was old. It’s not that I wasn’t acquainted with old things. My parents had only at rare intervals bought a stereo to replace our one-speaker hi-fi system, covered our bedroom floors with shag carpeting, and and brought in some Danish Modern furniture. Whatever they didn’t replace, I suppose, was old. The difference was that everything in the Old House seemed of a piece. It wasn’t the 1970s there, but the ‘50s, or even earlier. Time had forgotten everything behind those pulled roller shades. Visiting my friend’s house contributed to my youthful belief that, at a certain point, every grownup stops updating. The ensuing decades have lent me a more nuanced view, and when I think of the contents of that house I no longer think old. I think swank. Would it be possible now to gather those antiques in one place at any price? And what would possess anyone to unload them? My view now is: whatever it is, hold out a little longer. So I was surprised that when I recently announced I had just bought my first cell phone, several of my friends called me a Luddite. I suppose that was a put down. The irony is they were telling me this on Facebook. I have an uneven relationship with technology. I’m unenthusiastic about electronics that are small. Or expensive. But if I’m anything, I’m a Luddenite. While our old furniture was getting older, I was in front of the TV watching Password. That Alan Ludden, he sure could host .